In his two decades in the senior living industry, Juniper Communities CFO Chuck Hastings has seen many changes, but one stands out: consumers’ evolving expectations and needs. And failing to keep up with customers can have dire consequences. “That is where a company can make some real financial missteps … when they don’t listen to the customer and they’re not in step with what families want in a particular submarket,” Hastings told Senior Housing News. Failing to stay attuned to customers is one of two big mistakes that he believes are common in senior housing, with the other being companies that overpay for acquisitions. Hastings made these observations in a wide-ranging interview for the first installment of Senior Housing News’ “Bottom Line” series. SHN is connecting with chief financial officers to gain greater insight into how the evolution of the industry is creating new financial risks and opportunities, and to learn how these C-suite leaders are helping guide their companies into an exciting but sometimes uncertain future. For Bloomfield, New Jersey-based Juniper, that future involves an innovative play into the Medicare Advantage space. In the nearer-term, Hastings is less concerned about labor expenses than about new competition, and he’s in a wait-and-see mode on growth in a tough M&A environment. Currently, Juniper’s portfolio encompasses 22 communities in New Jersey, Florida, Pennsylvania and Colorado. You joined Juniper in 1996, and have always been in a finance-related role with the company? A lot’s changed in the last 23 years. Is it fair to say that senior living has gotten more complex operationally and financially, and is that placing new demands on you as a CFO? Part of my answer is very specific to Juniper. When I first started with Juniper, we did not not have an operating platform. We were a private owner of real estate, and a small one at that. Then, for a variety of reasons, we decided to get into operations and operate what we own. Many real estate owners, other than REITs, make that decision, it seems, at some point in their life. So that change dramatically complicated things for all of us, not just me. Once you get into operations, you’re dealing with much more minutiae, much more detail. You’re dealing with employees, you’re dealing with payroll, you’re dealing with regulations. I think even for companies that have been in operations for a long time, operations have gotten more complex. We’re primarily an assisted living company, and the regulations in assisted living have gotten much more stringent. Not necessarily nursing home-like, but they’re trending in that direction. So, the regulatory environment is much more strict. The compliance arena requires a lot more attention. And public reimbursement is slowly creeping into assisted living. So, I think if I were to generalize, I would say that’s what’s made the financial end of the operations of our business more complex, is the regulatory and compliance end. And then you have short-term changes, such as, we have a tight labor market. Sometimes, on top of that, the capital markets get tight. They’re not tight at the moment, but if and when capital markets do get tight and we still have a tight labor market, then you’re going to have the perfect storm. Things are going to be really challenging at that point, but thankfully, we’re not quite there yet. Do you foresee capital markets tightening? When I say the capital markets are not tight, what I mean is, there is a lot of debt available, interest rates are still relatively low, spreads are relatively low. From a grand historical perspective, there is a fair amount of debt out there. It’s gotten a little tighter, certainly, since the Great Recession. Underwriting standards of banks have gotten more stringent. I certainly hope that the capital markets on the debt side don’t get too tight — and I don’t think they will in the next three to five years — because debt is such as driver of our business, not just at Juniper but industry-wide, and when the debt market tighten and debt becomes more expensive and difficult to get, our industry really doesn’t grind to a halt but it becomes much more difficult to grow, both on the acquisitions side and development side. And the demographic bulge is still eight to 10 years away, for an assisted living resident. That’s when the demand is going to have to be met, and we have to be sure the capital markets are healthy. But that’s a longer-term issue. Short-term, I think the debt markets are going to be okay unless there’s some sort of macro shock, but let’s cross our fingers that that doesn’t happen. There is a ton of equity around. A ton. Juniper doesn’t tap the equity side. We’ve got our own equity in-house … so we don’t experience that directly on the equity side. Can you describe one or two moments of change during your time with Juniper, when you realized that you would be facing new challenges and might need new skills? For example, when the Affordable Care Act passed in 2010, did you sense that would change things? I’m going to give you an answer which is maybe not what I should or what you’re expecting, but it’s the first thing that came to my head: The biggest change over the couple of decades is the customer, and specifically, the customer’s demands and needs. There are two areas where a senior living company can make a big misstep. We’ve seen this time and time again. One is overpaying for a portfolio. The classic Brookdale, Emeritus situation. That we’ve seen over and over again. That is a big problem for companies, if they overpay for a large asset or portfolio. But, somewhat unrelated to that, the customers’ wants have really changed over the years. Twenty-three years ago, assisted living barely existed. It was still primarily a nursing home you would go to, if you got to that stage of your life and had those needs. But as time went on, the customer told the market they didn’t want to go to a skilled nursing facility. They wanted assisted living, they wanted something more residential. And, over time, they’ve demanded more options … One of the things we’re currently seeing is customers want larger units for close to the same price. An assisted living unit today that we would build is going to be much larger than one we built two decades ago. I’ll give you an example. We built a building in Chatham, New Jersey, which is a nice, upscale commuter market. We built a building there, our assisted living units were 300-some square feet. You would never build that today. And if you did build it, you would be completely unsuccessful. The challenge for CFOs is not only to keep an eye on the regs, compliance and expenses, but you really have to step out of that and make sure that you’re keeping a very close eye, along with your operators that you work alongside with, on what the customer wants. [You need to be sure] that you’re either building or buying something which gives them what they want or anticipates what they’re going to want a couple years down the road. How do you keep the finger on the pulse of what the consumer wants? I think there’s an informal and formal way to do it. I think both make sense. The informal way: We’ve got 22 buildings in our portfolio, so we’re a mid-sized player at best in our space, but we’ve got a big enough portfolio where informally we can see where our buildings are full and our customers are happy, and where that’s not the case. Sometimes, that’s driven by management. You can have a very pretty building with beautifully appointed, large units and a lousy management team, and your census is going to be lousy. But, all things being equal, you can look at your portfolio and see which buildings are full and which ones are not. In our case, we know that our buildings that are updated, with larger units, more in-house services, those are full. We have a couple buildings still which are not purpose-built, slightly smaller units, and they’re not doing as well. The formal way is to actually engage your customers. Focus groups … It’s hard to get customers in focus groups to really be forward-looking. The first answer you’re going to get from a customer or family is, I want the care to be top-notch. I want my mom or dad to be somewhere where people really care. But if you do the focus group correctly and force them to make trade-offs, that’s where you start to see that customers are really smart — sometimes without even realizing they’re making these trade-offs. They want to make sure the care is great, but they want to be sure they’re paying a reasonable rate for their room and they’re getting a lot of square footage for it. So, focus groups and getting direct, quantitative feedback from customers … those are the two ways to do it. I think you constantly have to do it. You can’t do it in 2019 and then not do it for a couple years, because things do change fairly quickly. Juniper CEO Lynne Katzmann has talked about putting together a consortium of providers to take advantage of new Medicare Advantage opportunities. Does that intersect with your role, are you having to learn the ins-and-outs of Medicare Advantage? Absolutely. That’s a big part of who we are. If we can get that consortium up and running the way we think and hope we can, it could have a dramatic impact on us financially. The hope is that it will be a payer source at some of our buildings. I think Lynne thinks there’s also a broader societal benefit. We in the business believe that what we offer on the senior living side is a great service and the outcomes are better than when people live at home. 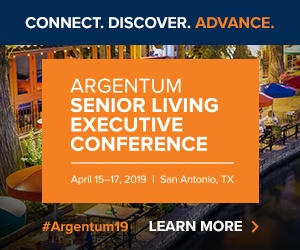 So if Medicare Advantage really does start to grow in its payment of senior living services, we and many of our partners in the consortium think that benefits everyone, not just residents at Juniper buildings. It could have a real resonance beyond Juniper’s walls. These things are very fluid and forward-thinking and they may look different a year from now once they come into form, but it’s pretty exciting to see it come together. I wonder about the risks in it. I’ve heard you have to make sure you have a large enough beneficiary pool, and I think there also rules around how much profit an insurer can take out of Medicare Advantage. Are those risks, are they things you’re weighing? I think the honest answer is there’s still a lot we have to learn. Certainly, that I have to learn, and that our team has to learn, and it’s new to everybody. This is going to be a relatively new growth area for Medicare Advantage plans. So I certainly know that there are risks, and you just touched on it, this issue of scale. It’s really important. You can’t have a Medicare Advantage plan with Tim and Chuck as the members. It’s not going to succeed. It has to go beyond the scope and scale of most of our own portfolios. That’s why Lynne has been thinking of this in terms of a consortium, not just a Juniper thing. It’s exciting to be involved in an effort like this, but we also realize we have to be careful and thoughtful in how we put it together, because there are going to be some surprises along the way. It seems your CFO peers across the industry are really concerned about labor expenses, judging by the latest quarterly earnings calls for the public companies. How much do you expect labor costs to increase in the year ahead, and are there ways to keep them in check? I think it could go either way. I’m on the fence on this. I understand why people are concerned about why labor costs might go up, but I think there’s just as good a chance now that things might go in the other direction. We are almost 10 years into an [economic] expansion … 10 years is a long time for an expansion. There are some signs of trouble here and there. China is a concern for people, they seem to be slowing down. Apple’s recent announcement [indicates that]. I think certainly in the next 12 months, we may start to see a bit of a downturn in the economy. There’s nothing good about that, except with labor. So, I think we’re a little less concerned about it. Most of our residents are happy to pay a little more if we have good staff in place, and they understand what’s happening in the labor market. Customers understand that if we have a price increase, it’s to pay for labor. If not labor, when thinking about the balance sheet, are there areas that are causing concern for 2019? Are there areas where you expect to cut costs or grow revenue? We think about things really simplistically. We’re not publicly traded, so we don’t have to be concerned about earnings short-term. We think about cash and cash flow. I’m going to give you an answer that’s a bit of a non-sequitur, but what concerns us and affects our balance sheet, cash flow and cash balances in most submarkets we’re in is competition. Specifically, new competition. In a couple of our markets, specifically suburban Denver, some of the markets we’re in in Pennsylvania, central New Jersey, and southwest Florida, there is a lot of development that’s either come on or is about to come on, and whenever that happens, an accounting and finance nerd like myself gets concerned in the short-term about cash flow, because these competitors need to fill, they’ll be aggressive, they’ll cut prices. From my perspective, I’m not nearly as concerned about wage costs and staffing, I’m concerned about the new competition that’s coming on in our markets, and I would include in that some of the home care and private-duty offerings that are really growing pretty quickly in our submarkets. They’re an invisible competitor. Another thing we’re seeing is some of the CCRCs are doing what they would call a direct admission. Meaning, if Tim needs assisted living and is not thinking of moving into a CCRC, the CCRC might say, well, we’ll take you directly into our assisted living wing, and you don’t have to pay us a $400,000 entrance fee. How many CCRCs are in the Juniper portfolio, and do you do direct admission? We have two CCRCs. I think [direct admission] is somewhat unique to our markets. We’re in Pennsylvania, and you always hear that the markets which are most mature with CCRCs are, in particular, southeast Pennsylvania — the Lancaster area — certainly Florida, and parts of the Southwest. They have mature CCRC markets … and a lot of competition. We’re not doing this in our CCRCs, but we know there are other CCRCs which are having census challenges, and they’ll stray from their entrance fee model to get people in, as I’ve mentioned. Given the concerns with new competition still coming online, what’s Juniper planning in terms of growth? Are you evaluating potential acquisitions, do you have any development plans in the works, or are you in a wait-and-see mode? Probably the latter. We’re more wait and see. Not by choice, but there’s still a lot of capital — and I’m sure all CFOs are telling you this — there’s a lot of capital out there chasing deals. We constantly bid and almost never win in our bids for acquisitions. We are lousy at ground-up development. We’ve done it three times in my career here, and it’s just not who we are. We will do renovations of existing assets. That’s something we can do and that’s a bit of a core skill for us. But our growth has always been in the acquisition of undermanaged, complex operational challenges. But people are paying up, they’re paying a premium for all types of assets. So, we’re still looking, we’re still bidding, but we’re fairly conservative in our pricing and our assumptions, and we have a very different capital base from everybody else. We’ve got about 52 individual investors as our investor base on the equity side. So, they’re patient, they don’t need to get out in three to five years. We don’t have venture capital pressures, we don’t have private equity pressures. We are forced to be disciplined because of them. They don’t want us to pay up for something. So, we have not been able to grow. The last acquisition we did was a CCRC which we took over in the beginning of 2017. We have not made another acquisition since that time. We’ve been growing some of our ancillary service business in-house, same-store. But we’ve found it really difficult to grow in the last two years. In terms of relationships with capital providers, you also have a relationship with real estate investment trust LTC Properties, correct? We do. We have a relationship with LTC and with another large private equity player, but in that case, we just do management of a couple buildings for them. We do think that relationship will grow. But that particular relationship really just benefits our management entity, it doesn’t grow our asset base, obviously. So, we like a mix. We like having a couple buildings with LTC on the REIT side. We do not want our entire portfolio to be REIT-financed. We like owning and operating most of what’s in our portfolio. That’s always been our approach. But that’s one of the things that people aren’t aware of about Juniper, is our unique equity base. How many buildings are with LTC? Has the tax reform package that passed in late 2017 affected Juniper at all? It really hasn’t, except in one regard. The 52 individual investors. It affects them. So, they have a lot of questions for us about what’s going to come through on their K-1, and what the pass-through regs are now going to be. But other than that, it has not affected our business. I believe every member of the Juniper executive team visits every community every year? Can you talk about your experiences in doing that and what it contributes to the culture of the company? I’ll go out and do, at a minimum, a training. It’ll usually be something close to my heart or something that I have to offer to the teams at the buildings. So, in my case, it’ll be something finance-related. It really helps connect us at the home office to everyone at the building. I think it’s terrible when folks like me hunker down in the home office and never walk the halls of one of our buildings. The other thing is that Lynne has required, over the years, that people like me take a stint as what we would call a regional director of operations. It means that I really have to get out and oversee a building, and be in charge not just of the financial goings-on but everything: staffing, hiring/firing, regs, surveys, everything. So, Lynne wants her CFO to have felt the pain and joy of being in operations. I have slept in many of our buildings, been involved in surveys, been directly involved in hiring and firing and strategic decisions at the building level. I think it’s really important to our culture, because as I said, we’re not a development/construction company, we are operators. Mission versus margin seems to be a constant theme, maybe struggle, in senior living. Do you ever feel like you’re waging an uphill battle to protect the margin when other people in the company are freer to focus on mission? How do you define a healthy margin in this business and make sure you’re striking that balance between doing good and doing well from a financial perspective? I have a very biased answer on that. I think it is much easier to do both as a private company. I think it’s really difficult to balance mission and margin as a large public company. For Juniper, we don’t have those public markets pressures, and we can make longer-term investments like the MA consortium. I don’t know if a Brookdale — and I know Brookdale is sort of playing in that [MA] space — but I don’t know that Brookdale can do it in a way that Juniper could. We’ve got a very long-term, loyal equity base, and they’ll give us a long rope to balance those sorts of things. And anything we do related to mission, we’re very fortunate, we get a lot of support on that front. I’ll give you one example. We’re rolling out some programs that give our employees in essence some free health benefits, above and beyond their health insurance. It’s related to on-site access to physician care. If you work in a Juniper building and you’ve got the flu or a cold or bronchitis, we’re providing on-site access for our employees, and it’s not a money-making effort for us. That’s part of, to me, mission. I think your governance really helps in that balance between mission and margin. You were a history major at Princeton in college. How did you go from studying history to being a senior living CFO? Did you always have a head for business? I loved being a history major and was a history major because that’s what I wanted to do — I knew it wasn’t going to have too many job prospects at the end of the day. As I got to the point in my college career where I needed to get a job, I decided I wanted to get a business or consulting job. I was very fortunate that the person who interviewed me knew that I was relatively clueless — and that’s being generous — about the business world, but they knew I was passionate about it and desperate to learn, so they took a chance on me. This is a small consulting firm, very financially focused. If somebody senses that you have passion about something, they’re much more inclined to take a chance on you. I know that’s true in Juniper’s business. You want someone who really cares and is passionate and wants to learn.